Monarchs are charismatic butterflies that migrate across the United States to their winter homes, as far away as Mexico. NRCS photo. Did you know it’s travel season for monarch butterflies? Each fall, millions of these black-and-orange butterflies journey south from their summer quarters in the United States to their winter homes, which for some is as far away as Mexico. Populations of these beautiful insects have decreased significantly over the past two decades, in part because of the decrease in native plants like milkweed – the sole source of food for monarch caterpillars. Because monarch butterflies are always on the move, they need to have the right plants in bloom at the right time along their migration route. USDA’s Natural Resources Conservation Service (NRCS), agricultural producers and a wide array of other groups are working to create and enhance habitat to help the species rebound. A promising new study has uncovered a piece of the puzzle. A research team at Iowa State University is studying how monarchs grow and develop on various species of milkweed in hopes of unlocking the full potential of monarch habitat restoration efforts. 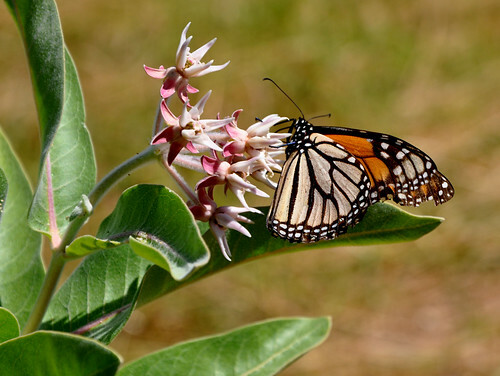 Milkweed plays a vital role in the life cycle and migration of the charismatic butterflies. While the importance of milkweed is clear, the performance of different milkweed species in supporting monarch population growth is not. Because Iowa is home to 17 different native species of milkweed, it is an ideal location to study how each plant species affects monarch growth and survival. This is key to maximizing the benefit of the many acres of milkweed being planted for habitat restoration. 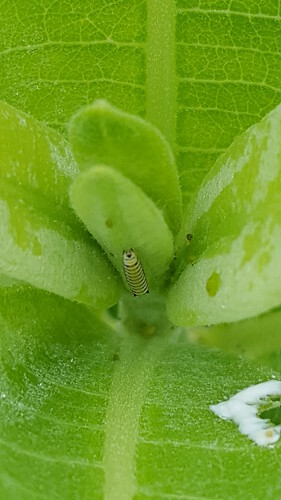 In order to monitor the growth and survival of larva across milkweed species, the project team at Iowa State University evaluated nine of the 17 native milkweed species in a greenhouse experiment. Project findings after two years show that while monarchs can survive on all nine milkweed species tested, the probability of reaching adulthood varied from 30 to 70 percent. A member of the project team published an article highlighting this study in the October 2017 issue of Environmental Entomology. The greenhouse experiment determined that monarch larvae have a higher chance of survival on specific species of milkweed. Photo courtesy of Iowa State University. 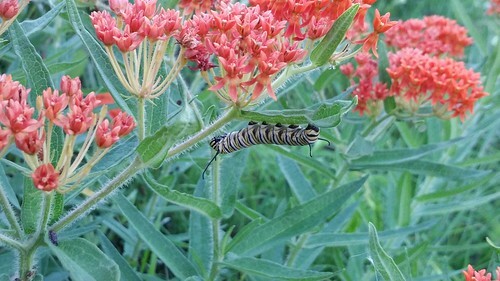 Larval survivorship differed most noticeably between larvae that fed on tall green milkweed (A. hirtella) and butterfly weed (A. tuberosa) or poke milkweed (A exaltata). Fewer monarchs that fed on Sullivant’s milkweed (A. sullivantii) survived than those that fed on poke milkweed (A. exaltata). No other pairwise differences in larval survival were significant. By developing and sharing an understanding of how different milkweed species influence monarch development and survival, this project is contributing to efforts to help this species recover. In addition to the greenhouse experiment, the team is currently evaluating the nine milkweed species at field demonstration sites across Iowa. 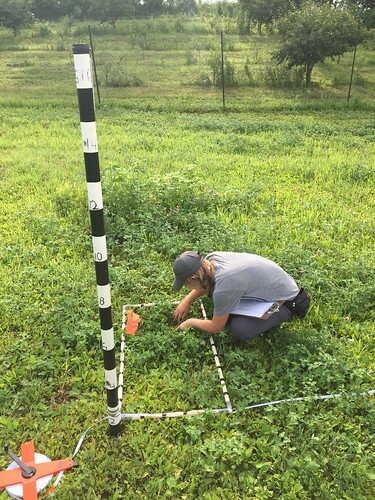 In addition to the greenhouse experiment, the team is currently evaluating the nine milkweed species at field demonstration sites across Iowa. Photo courtesy of Iowa State University. The study was funded by NRCS through a Conservation Innovation Grant, and findings can help NRCS in its work with producers on private lands to create and enhance high-quality habitat for the species. Two-thirds of the continental United States is privately owned, and landowners and agricultural producers can play a crucial role in helping the monarch recover. Through the Farm Bill, NRCS provides assistance to agricultural producers to help make conservation improvements that benefit the monarch while also increasing the productivity and resiliency on working lands. To learn more about Conservation Innovation Grants, visit our CIG webpage. To learn more, visit our Working Lands for Monarch Butterflies multimedia story or contact your local USDA service center. Monarch caterpillars rely on milkweed for survival. NRCS photo. And to think, we used to just cut them down as weeds. The research is pointless and a waste of taxpayers dollars because it will never be logistically possible for mankind to ever "recover" the size of the eastern migratory monarch population by planting milkweed. Why? Because human activities are causing tens of millions of milkweed stems to disappear from the landscape every year hence it is futile to ponder the possibility of an annual planting effort that would ever be capable of successfully growing and establishing hundreds of thousands of new stems per year (in wildscape settings) let alone tens of millions of them.